Happy Mother's Day and a Giveaway! I have a feeling I know what I will be getting this Mother's Day. Adam has been catching all sorts of creepy crawly critters in the garden. I do not mind though, as a mama to three boys I have seen just about everything :o) And who does not just love a cute fuzzy caterpillar! I hope that all the mamas out there are going to have a wonderful Mother's Day. Small plans or big you are all amazing and I hope at the very least you are able to take a nap or have the dishes dome for you. Those are the things I look forward to (hint, hint, if anyone in my family actually reads this). Five half yard cuts of Heather Ross girlie fabric!!!!!!! After the last giveaway I realized that the girls were slighted!!!! Not a one fabric for the pinks in the house. So I am hoping to right my wrong and be fair! The winner will be chosen by random number on Thursday May 12th. Y'all have two chances to win the pretties above!!!!!!! Leave a comment on what you are doing for yourself or your mother on Mother's Day. If you would like to have a second entry...let me know you are a follower or new follower in a separate comment. Doubles your chances!!!!! If you are a no reply blogger please leave your email address in the comment box with your response so if you win I can reach you to send you the fabric yummy!!!!! I hope everyone has a wonderful Mother's Day!!!!!! i am going garage-sale-ing with my BFF in the morning. off to a family potluck with friends after that. couldnt ask for a better day...unless of course, i win! I will, unfortunately, be working on Mother's Day. Health care waits for no one. But today I am enjoying being a mama to two and some great apple pancakes and sausage drenched in syrup- and hopefully some sewing time! Happy Mother's Day! My mom lives in a different city so I'll be calling her to wish her a happy mother's day, and she'll be visiting in a couple weeks' time. Thanks for the sweet giveaway! I'm going to dinner with my DD. Thanks for a PINK giveaway! The fabrics are beautiful! I am hoping my hubby is taking us to breakfast tomorrow morning at my favorite pancake place. I am making myself a new diaper bag as well! Thanks for the fantastic giveaway! I made my mom a 241 Tote Bag for Mother's Day this year using her vintage pillow cases :) As for me, my husband and 4 little ones (3 of whom are girls who would l.o.v.e. all that pink fabric) gave me an amazing gift - a new sewing machine!!! Mother's Day will be sad for us this year, as we lost my mother-in-law two weeks ago, and I am still missing my own mother, who passed two years ago. Still, I know my husband and daughter will be making a big fuss of me, as the only mother we have left. We will all try to call on only the wonderful and happy memories of the mothers who have gone ahead. Happy Mother's Day -- I'll be sewing, finishing a dress for a granddaughter and starting a matching shirt for a grandson. All family live elsewhere, but we'll talk by phone (or webcam). Thanks for the pink (granddaughter is partial) -- hope I win! I am so hoping to go get a massage tomorrow! Happy Mother's Day! Since both my mother and step-mother are gone, I'll tell what I'm doing for Mother's Day thanks to my wonderful family. First, we'll head out to the 7:30 mass. After that and some doughnuts and coffee with friends and church family, we'll be heading downtown San Diego to the Gaslamp section for breakfast at the Broken Yolk. I'm sure we'll load up on all kinds of yummy breakfast treats there, so, we'll have to walk to Petco Park to go watch the Padres play against the Arizona Diamondbacks! My husband became a season ticket holder and he traded in tickets so that the whole family could go to the game! It's something I enjoy doing; having everyone - 3 grand babies we're raising and our teenage son - together. I'm sure we'll sneak in a couple brews in the beautiful San Diego sunshine! Go PADRES!!! Hope everyone else out there has a wonderful sunshiny Mother's Day, too! Such pretty fabric! For my Mother's day I would love to sleep in and then get an hour in my sewing room to myself! I am also a follower! Love the cuteness that comes from your blog! Nothing planned for mothers day... My husband and daughter gave me a bouquet of flowers after our trip to Safeway. I've postponed my celebration with my mother for a week. Hope you have a great one. I follow your blog in my google reader account. Happy mothers day and good luck with the crawling gift. Ah Mother's Day - breakfast with the kiddo's (Bill goes to work at 4am) then we're gonna have an afternoon relaxing by the pool! My boys are making me a mothers day brunch and then we are surprising my mother in law and bringing dessert over to her house! Have a wonderful mothers day. I am a new follower! thank you. I so wish my mum was still here to share everything with, but especially my daughter! Anyway, wishing all mums everywhere a very happy mothers day. I live in the UK so mothers day was in March, for it Icooked my mum dinner, nothing fancy, just so she didnt have to cook. im also a follower. YAY! i'm sleeping in, eating donuts, and going for a run on mother's day. sounds perfect! I'm a UK Mum (Mom lol!) so our Mother's Day has been and gone....but I was very lucky and got a Spa day as a present - I can't wait to go! I'm hoping for some afternoon sewing time this Mother's Day. I hope to spend my Mother's Day working in the yard. Soooo much to do, but I do find it relaxing to dig in the flowers. The weather is finally Springy here in northern Wisconsin so we best enjoy it! Happy Mother's Day to you. I am a follower of your blog. I've not seen that girly fabric before - cute, cute, cute! Thanks for the chance to win it. Good evening. I'll be travelling back home from spending the weekend with my mama. Hope to spend some of the rest of the day getting in some sewing time , haven't been home in 3 weeks! I'm already a follower, thanks! Thanks for the giveaway. I follow your blog! We are going to have open house tomorrow, we put the house in the market, time to move on... kind of sad. I will have a quiet mother's day. Some time with my son and some sewing time. For Mother's Day,I am going to watch some Alfred Hitchcock movies,order in (I don't want to cook) and hang out with 3 yr old son since daddy is out of town for a bit yet. Happy Mother's Day!! My 4-year old son *loves* rolly polly bugs and occasionally is interested in others, hehe. Tomorrow we have church, time with my mom, and time with my mother-in-law on the agenda. Should be a full but fun day! My husband and I will be taking his mom out to a fancy brunch buffet. Now a follower! Thanks for a fabulous giveaway!! What a great giveaway! I am making a salad for the family dinner. I also made a freezer dinner for my s-i-l who is a mom of 5 and expecting her 6th any day. My hubby is away, so it'll be just my DD and me relaxing at home. I"m not sure what is happening for me, but it will be a surprise for sure! I'm going to a baseball game (Anaheim Angels) with my husband and my son. They are giving away a really cute hat for the Moms in attendance. Thank you for the great give away chance. Happy Mother's Day! Just love your Blog+your ideas! My Mother is with Jesus. My family will take me out to a fish dinner following our Worship Services on Mother's Day. 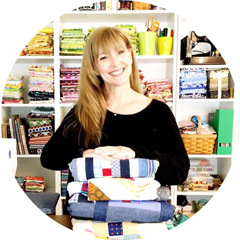 Thanks for sharing the cutest fabrics for a neat Giveaway! What will I be doing for Mother's Day? Hopefully I'll get a lot of quality sewing time! Oh, and some quality time with the kids too. : ) Thanks for a fantastic giveaway! I sent my mom a bouquet of flowers. I'll be having a long phone call with her, since we don't live in the same state. Since my mom will be going to Hawaii for Mother's Day to spend it with my sis I'll be going up to Big Bear in CA with my aunt for a 3-day scrapbooking retreat! I LOVE PINK!!! & HR!!!! What a giveaway! I am hoping to finish up a table topper quilt that I am making my mom (won't get to see her tomorrow since they don't live close enough, so I have a little extra time to finish). We have no special plans tomorrow, but I usually get to sleep in, and, if I am lucky, breakfast and tea in bed. YUM! Thank you for the chance to win such delights!!! My brother and I are taking our parents out for lunch. Thanks for the giveaway! Wowee zowee - you are so generous! Both me and my pink loving little girl would love these! What a fabulous giveaway! I love love those pink bicycles! Oh my goodness...if ever there were a time that the random number generator would pick me, I hope this is it! My brothers & sisters & I are taking my mom out for brunch :) I also have a stack of fabric that she picked out, waiting to be a quilt. Unfortunately, it is still just a stack of fabric & there's no chance it will become anything more than that by tomorrow! I am going to call her, and I am working on a quilt for her, hopefully I can give it to her in a few weeks when I see her next! Happy Mother's Day! DH is out of town so it'll be just me and the kids however a relative has convinced me to join her softball team which starts tomorrow and it looks like I'll have someone to keep an eye on the kids while I play. Yay! Happy Mothers' day. I am a follower. For mothers' day this year, we will go out to dinner with all the kids (they can all go!) Then move my daughter home from college. Oh wow these are lovely! Happy mother's day! I love following your blog!! Thanks for the giveaway! My daughter, and my mother-in-law and I are attending our annual Mother's Day Breakfast at our church. Then my husband it taking me out to eat. Good times!! Pretty, pretty fabrics, I feel faint just looking at them. I'm having breakfast in bed, spending an uninterrupted (and un-commented on) few hours reading blogs. Then I will get up and go to my sewing machine for another few hours of uninterrupted (and un-commented on) sewing. (I'll let them roll their eyes, but no words!). Hope you have a lovely day to do the things you want to as well. Happy Mothers Day. Great giveaway! We are spending Mother's Day on the road! I'm a follower! Thanks for the second chance. I am going to spend the day trying to plant some flowers, if it doesn't rain. Happy Mom's Day! Thanks for the giveaway! Mother's Day is also known as "No Diaper Changing Day" in my house... Father's Day takes the same name :o) So, I guess that's what I'm NOT doing on Mother's Day!!! What a sweeeet giveaway. I'm a follower! Since my mother will be moving in with me soon, I'm planning on a bedroom makeover for her! I'm a follower! Thanks for a chance at such a lovely giveaway! I will be hanging out at home with my son and my sister...Nothing particularly special planned. I treated my mother to a fabric store trip and lunch out today (Saturday). Sunday I'll take her to church and to a celebratory dinner at my niece's. She is a wonderful Mom. Tomorrow on Mother's Day morning both my mom (83) and I will be sitting up in her bed together (she lives with us), and my husband will be serving us breakfast in bed: stuffed French toast with fresh strawberries and whipped cream on top! My husband has done this for me every year, and now my mom gets to experience it! I can't wait! Yes! I am a follower! as it is also our anniversary tomorrow, we went out to dinner tonight. He treated us to Ruths Chris! We'd never been and it was delish! He also cleaned the house this morning while I was running errands and I'm pretty sure I won't have to change any diapers tomorrow. Sound good? Kim!!! Seriously!! :) Well that pink stash looks LOVELY, and since I'm the only "pink" in my house, I take what I can get. Thanks for your generosity :) And we of course FOLLOW! Happy Mother's Day! I made my Mom a tote bag for her bible and study books so she can be "stylin" on Tuesday nights :) Thanks so much for this opportunity! We have 4 grandsons, but (finally) 2 grand-daughters due any minute! One due the 12th of May and the other due June 20th! I hope I win...I need pink! I will be making dinner for my mom (bbq steak and potato salad is what she chose). Next weekend I hope to hit a few yard sales for my fun time! I am a brand new follower (though repeat visitor) of your lovely blog. We eat waffles, go to church, go to the park and relax!! I have the perfect project for those fabrics! I wish she would design in those cottons again- so so soft! I'm doing the 5K Race for the Cure walk with my family! I'm a 24 year breast cancer survivor! Love that fabric! I am hoping to sew on mother's day. thanks for the give away and happy mother's day to you. Love the pink fabric! For Mother's Day we are having my mother over for bbq hotdogs (her favorite) and other tasty treats. Happy Mother's Day to you!!! No plans for mother's day for us, just church and the rest of the day relaxing with our family. Thanks for a greta giveaway! And all of your pictures are lovely! For mother's day I am having my in-laws over and my husband is preparing us lunch with mimosas. Then I plan to hug and cuddle my baby girl all day long. Oh and for Mother's Day - I hope to stay in bed, maybe read a new book and sew! For mother's day I am taking my mother to dinner. Ahh, Mother's Day! My own Mom left us in 1998 and I still miss her. The Easter Bunny, in his infinite wisdom, brought me her favorite Mother's Day gift, a coral impatiens in a hanging basket...she loved that so much that we got it over and over for her -- and each time was new! For our daughters who are mothers, we have gotten pink roses...does that tell you that you have the right color of fabric? For me? I am planning on some happy workroom time! I am already a follower -- naturally! Love your blog! Well I hope that they heard you and your dishes are washed and put away. For me I have the whole day to sew. . and call my own mother! I'm spending mother's day relaxing and hopefully sewing after breakfast out with the family. Have a great Mother's Day! thanks for the giveaway. breaky in bed followed by a lazy day - a bit of sewing, a bit of reading in front of the fire! i love the fabric here! I am already a follower, yeah! Laze around myself, gave mom a new computer! thanks for the chance I love this fabric and have never been able to buy any Heather Ross fabric! We'll be spending Mothers Day watching the Yankees on tv--a real treat for me! hoping to do a little sewing and maybe a nap! Taking it easy with husband and dog...hope to get some sew in. *sewing. Also, I'm a new follower! We had Mothers Day a couple of months ago here in Ireland and I spent it having fun with my family. I made my mum a few nice things for it too! We are at a wedding out of town so I won't be there this year - but I made sure to send a card! Lovely giveaway! For mother's day I will spend some time with my mom and then take my son to the park. The reward for myself is that when my son is good and tired from the park I will take a nap and cuddle with him (he's still 3). I was up five hours last night working on finishing my Supernova quilt and the nap will be my reward. Happy Mother's Day to you as well. I am a follower. LOVE the fabric with girl bikes. Thanks for the chance to win it. Happy Mothers Day. Thanks for hosting this competition with such a lovely prize! Happy Mothers Day to you, mine has been so nice. Happy Mother's Day to you too! DH and I got back last night from spending two days with his Mom. I visited a new-to-me quilt shop while I was there and bought myself a book and some fabric. Today I'm reading blogs while my breakfast is being cooked (love that). I may go to the fabric store and look for two more fabrics that I need to start a quilt from my new book. I'm a follower. Thanks for the great giveaway. I'm a follower! (Have been for a little while now). Sadly, my mom lives in Florida and I won't see her today, but I sent her a gift and a card earlier this week. I am going to treat myself to some uninterrupted time in my "sweatshop" today. I am working on a cathedral window project! Thanks for the shot at some really great fabric! I am having my mom over for supper tonight and we are just spending time together with the rest of the family. what could be better! Thank you for sharing those beautiful fabrics! I have these days so much pink in my mind - would love to win! Sadly I don't have my mom near to me anymore, but she is even more in my mind! I am taking a long nap today! I am a florist and have been working 16-18 hour days for the last 5 days! Happy Mother's Day! Awesome giveaway! I'm going to call my mum in a bit but other than that it's just the usual Sunday full of chores and hopefully some sewing. Home with my kids while my hubbie (unfortunately!) had to work. But they are playing sweetly together so I'm about to take them for ice cream! I'm taking my mom to her first ever spa treatment! I think she's doing it to humor me, but I'm hoping she'll be a convert afterward. She deserves some pampering! Here in the UK we had Mothers' Day in March! My children cooked the Sunday lunch and bought me a new Emma Bridgwater mug to add to my collection! i enjoyed lunch made by my girls and then off to visit my mother-in-law. I am taking a nap, and letting my husband mind the munchkin. Thanks for the darling giveaway. Happy Mother's Day! We are going out (3 generations) for Indian food. And I got my mom a lovely burgundy Dahlia plant in a cute pot! New follower too. Thanks for the give-away! I had a wonderful day! Went horseback riding this morning,and had all my meals cooked for me today! Awesome! I'm now a follower. Thanks for the great giveaway. I spent my day fishing, gardening & enjoying Spring! Today for my 2 moms I made them each a different quilted bag. My biological mom got a Diva Bag and my Step mom got a Bow Tie bag with a wallet to match. For myself I am doing nothing today. I am a follower and your blog is cute. I celebrated a day early with a mani/pedi, lunch and shopping with my daughter. Today was spent driving home and mowing grass! I've not done anything for myself today, but I plan to go get a pedicure this week sometime. My husband bought me flower baskets to hang from the porch, and I made a binder with my son's artwork for my mom, great day! And I am (and have been) a follower. Thanks for the great giveaway!